It’s always good to see a teacher blogging about tech they’ve found innovative uses for to help their teaching. We came across this gem on Facebook. This post is a shortened version of the original which appeared on Lana’s blog. I’m not a huge tech freak. I write things down, couldn’t bear to part with my teacher’s binder and use chalk and a blackboard to the max. However, I’ve become obsessed with a tech thingie on my phone. In fact, I think I might be completely in love with Evernote. At the risk of sounding like a painfully un-inventive copywriter straight from silicon valley, let me tell you, this thing HAS made my world a better place, meaning it has made me a better teacher. I used to try bookmarking interesting videos, articles and tips that I’d find online only to find myself completely ignorant of them the next time I sat down to look up something useful. Now I can have everything in one place, with tags to help me find notes quickly, organize my lessons, ideas and much more. At first I used it for my creative writing. I downloaded Skitch for Evernote which allowed me to take photos, edit them, annotate them with arrows, smileys and text, and then export them to my notebook with a click. Notes can be virtually anything. Weblinks, typed notes and lists, photos, files. I was also able to record audio and save it as a note. Finally I could have all my crazy little ideas in one place, ideas that would normally vanish after the third metro stop. Later on, Story ideas became its own notebook, with different notes, audio files and pics to get inspired. The Writing notebook became a stack, meaning I could now compile different notebooks with the same topic in one place. From using Skitch to keep my short story ideas in one place, I went on to make little household notes. I would then export the snippet to Evernote, into my Chores notebook, and add other things I needed to buy that day. I also added a tag in case I ever wanted to find the photo again so as not to have to go through the whole list of chores. I began to see Evernote’s potential for my teaching and, from then on, Evernote became my new PA. When it comes to staying organized, Evernote is indispensable. I have two main notebook stacks related to teaching: Online lessons stack and Academy stack. Each stack has its own notebooks. For example, within the Online lessons stack I have a separate notebook for each student that I teach via Skype. I save lesson plans, ideas, videos, tips and songs I’ve used with them, as well as student info (such as payment information, interests, weak language areas, etc.). In the Academy stack I keep different notebooks for each class that I teach. You get the drill. One of my favorite Evernote features is how quick everything is. 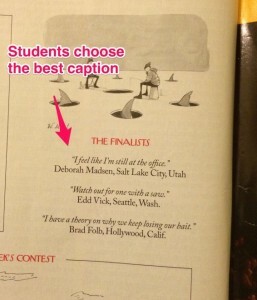 For example, I might be reading a magazine and stumble upon an interesting article. 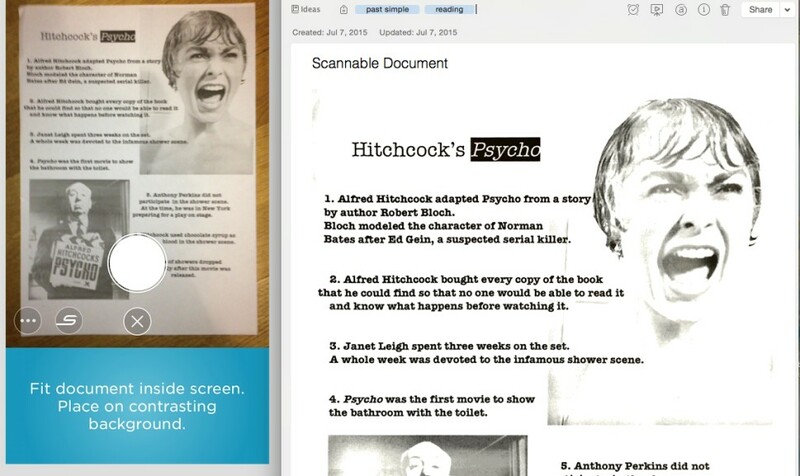 Instead of copying it and then scanning it (i.e, wasting paper) I use Scannable which allows me to scan a document with my phone and easily export it to Evernote, directly to my Online lessons stack – Student A notebook. This feature is great to keep your invoices (freelancer speaking here! ), documents, exams, worksheets and other scans organized. Left: Scannable. 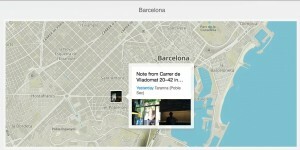 Right: how it appears in Evernote. I might use Skitch to snap a photo when I get an idea for an activity. I make sure to annotate it because I’m very forgetful and therefore the original idea could be completely lost on me in a matter of days. I then export it to Evernote straight to my Online classes notebook. I can also share any annotated photos with my class’ Facebook group or on Twitter, share a whole notebook/note with my colleagues, or send it via email. 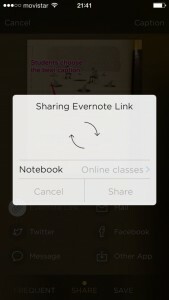 Other ELT uses for Evernote? Scan Post-its, business cards, crossword puzzles, the ingredients on the back of a cereal box … You know very well that anything might become lesson material. Use Evernote Webclipper to save interesting teaching websites and blogs and tag them according to your classes, students’ levels and topics. 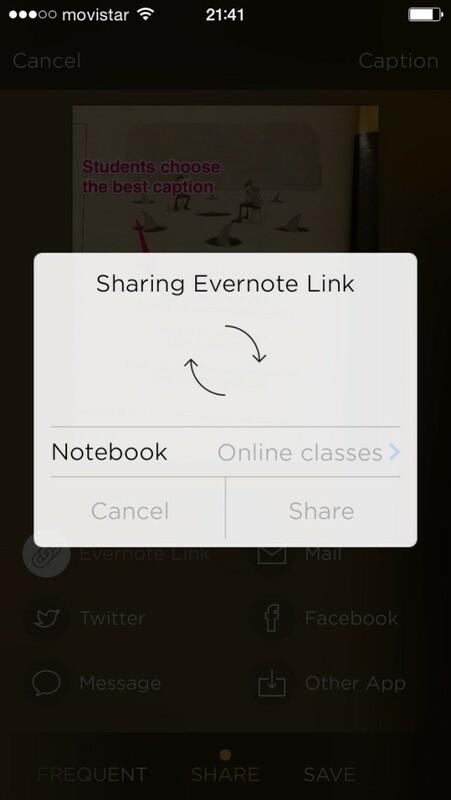 Take full or cropped screenshots with Evernote and save them to your notebooks or share with your students online. Walk around your city and take photos, then show them to your students using Evernote atlas and ask them to narrate your movements. (First, you went to get some coffee in Poble Sec …) You can literally make great speaking activities on the go with nothing but your phone at hand. 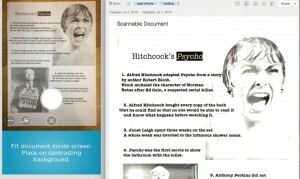 Scan your entire lesson plans or write them up as notes in your separate notebooks. 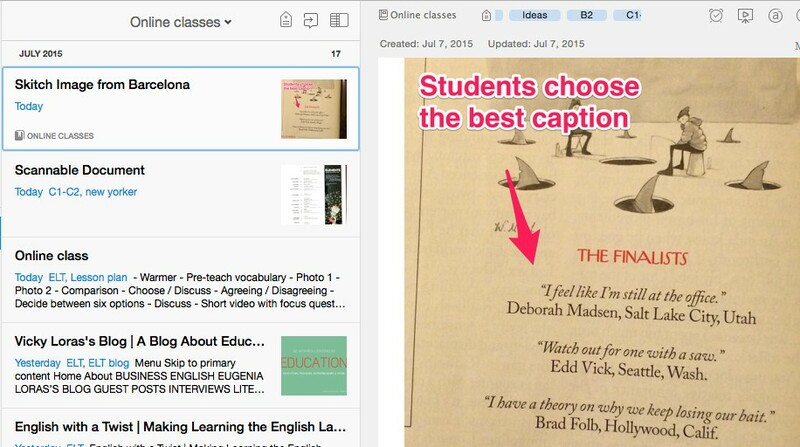 Snap photos right there in the classroom and then annotate them together with your students. You can later share them on Facebook or Twitter. Make checklists and set reminders to make sure you’ve planned everything for today. Remind yourself of the homework assignments you’ve given to each group/student and exams you need to prepare. Keep videos, photos and worksheets for your online students in one place, so you can access them easily during your lesson. Keep all your material tagged based on levels, so you can easily browse suitable activities. Make a warmers/fillers notebook with levels/topics/age tags to save yourself during a lesson that isn’t going so well. Share your notebooks with fellow teachers working in your school (after you’ve convinced them to download Evernote). If you’re teaching adults and they might consider getting Evernote, share notebooks with them as well. You can assign homework, share worksheets, videos, songs, etc. Record your student’s pronunciation and save it directly to his/her notebook so you can analyze different sounds to work on. Take notes and photos when you attend teaching seminars to make sure you don’t forget all the useful tips, games, activities and resources they mention. You can scan whole documents and use them later in your lessons. 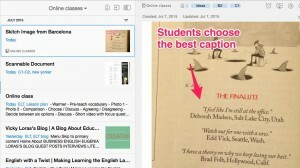 How are you using Evernote in your teaching? Post your comments below. Lana Haze is a certified English teacher living in Barcelona. If you have a post in you about how you’re using a non-teaching app to teach, like Slack or Trello for example, drop us a line at blog editor @ eltjam dot com. For other useful apps to consider using in the classroom, check out Mike Boyle’s idea for Siri. I love the ideas here! Evernote has been a big part of my workflow as a materials writer for a while now. 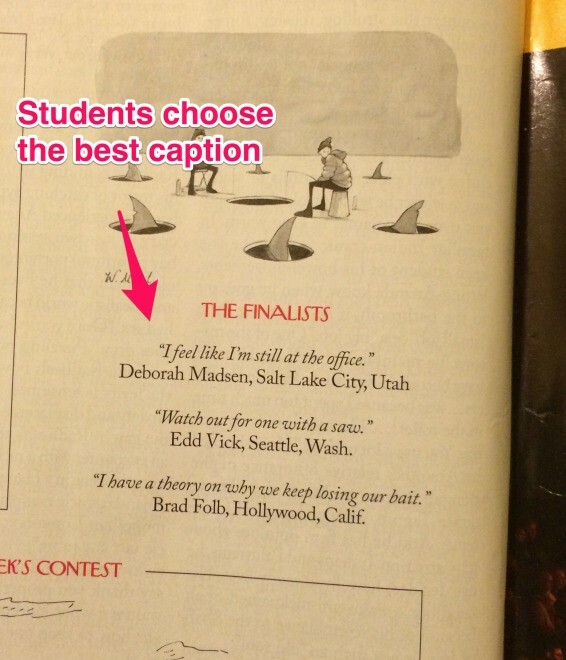 I save articles that might make a good lesson or unit (tagged by topic, grammar, level, market, etc.) and I love being able to find them days (or years!) later in an instant. It’s also a life saver when you get a great idea on the train or walking down the street. You can start writing wherever you are and then pick it up when you get back to your computer. A huge portion of my last couple of textbooks was actually written on Evernote for iOS on the treadmill at the gym! Actually, Lana’s original post on her blog also talked about Evernote and its uses for her writing! What an interesting article! Many thanks for sharing! I keep all my notes from conferences and development workshops in my Evernote, as well as my thoughts, ideas, and general reflective jottings – it is my CPD portfolio.